Everything that is painted on the spot has always a strength, a power, a vividness of touch that one doesn’t find again in the studio. Explore and be inspired by the glowing colors of Spring! Paint gardens, flowering trees, open landscape and more, during Fayetteville’s Annual Dogwood Festival. 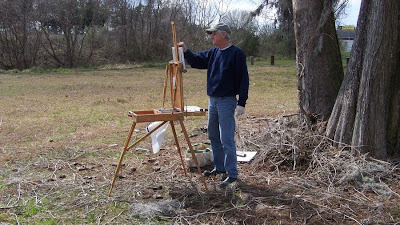 We will delve deeper into the aspects of plein-air painting such as creative composition, “seeing” then mixing the colors you really want, dealing with green, simplifying your painting and more. 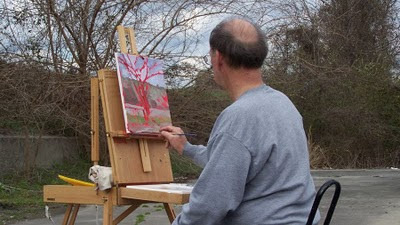 We’ll work rain or shine with instruction sessions, instructor demonstrations, and lots of time for you to paint with individualized guidance at your easel. 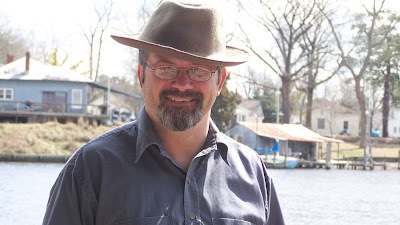 I will “coach” you in whatever style you work in: from tight Realsim to loose Impressionistic. For details about the workshop, including materials listing, you are invited to download the comprehensive PDF package. When: Friday, April 23 at 9:00 pm until Sunday, April 25 at 4:00 pm. Umbrellas Painting Contest open to anyone! This is going to be so much fun !! The Coastal Carolina Artists & Crafters Guild is participating in this celebration and has invited the public to join in with a painted umbrella contest ! Deadline for submission is April 17th. 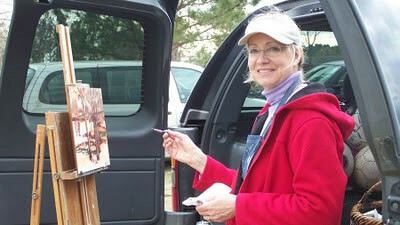 Sat., May 1st Spring Craft Fair & Car Show will include an umbrella painting contest. Open to all ages, best of show will win a trophy ! Theme: Onslow County's 275th Birthday. Come out to Riverwalk Crossing Park, 421 Court St, Jacksonville for the cake ceremony, hand crafted items, car show, scavenger hunt and umbrella winners. Painted umbrellas will be displayed on May 1st at Riverwalk, deadline for entries is April 17. Turn painted umbrellas in to Pumpkin Patch Country Store, 1103-A Wolf Swamp Rd, Jacksonville next to Pumpkin Center phone 910-347-1549. For more information about this event email ccacguild@yahoo.com or call 910-938-7077. Portion of the proceeds from the Spring Craft Fair & Car Show benefits the Onslow Shrine Club. May 1, 2010 Spring Craft Fair & Car Show, Jacksonville NC . Free admission. Coastal Carolina Artists & Crafters Guild and the Onslow Shriners invite the community to a day of fun and food while enjoying a showcase of locally crafted works of art and a car show. Held at the Riverwalk Crossing Park in downtown Jacksonville , the one day Spring Craft Fair is free to the public and will be from 9 a.m. to 4 p.m. on Saturday, May 1st. With lots of quality handcrafted works of art and good food, guests will enjoy meeting local artisans, participate in the Celebration of Onslow County's 275 years of History, view the painted umbrella competition, also be able to support the Onslow Shrine Club in their fund raising efforts; and for the car enthusiasts will enjoy the pampered vehicles on display.Artisans include: award winning photographers, intricate intarsia & scroll saw woodworking, fused glass jewelry, beaded jewelry, military bears, baby items, functional monogrammed items, kaleidoscopes & pens created from a variety of materials, Military items. There will be basket weaving demonstrations, raffles, scavenger hunt, cake ceremony and more. Portion of the proceeds benefits the Onslow Shrine Club. 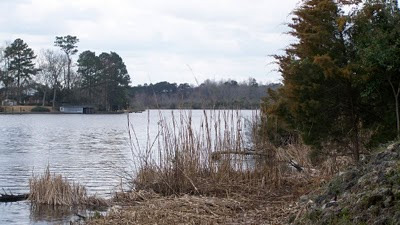 To contact the Onslow Shrine Club call 910-346-9482 and leave a message. For information about this event contact Coastal Carolina Artists & Crafts Guild at ccacguild@yahoo.com or call 910-938-7077. 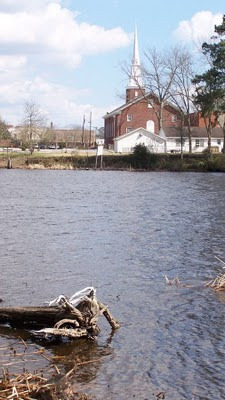 Riverwalk Crossing Park is located at 421 Court Street, Jacksonville , NC . 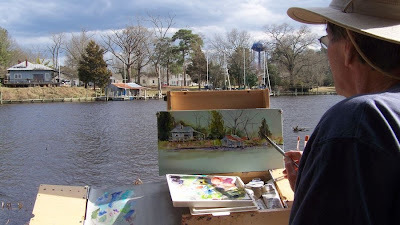 New Bern Artworks is organizing a juried show of 300 paintings to celebrate New Bern's 300th Anniversary. All OOPS members are invited to submit. 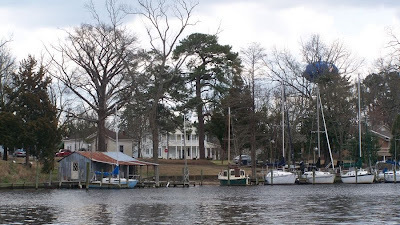 Work must relate to New Bern--past or present. 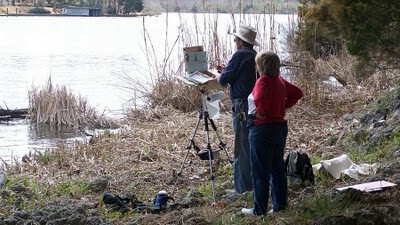 Painting must be plein aire. Any paint media is acceptable. Size: no larger than 11" x 14" or 154 square inches. Smaller is better. No Frame--all works must be on either an *artist "box," or 2" deep gallery-wrap canvas. Paint the edges black--do not wrap any part of the image around the sides. Do remember to attach wire for hanging. Work must have been done between September 2009 and April 2010. Works will be selected for the show. Juror will be Martha Williams. 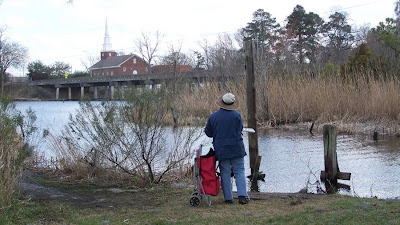 Hand deliver works to New Bern Artworks, Tuesday, April 27 through Saturday, May 1. Gallery hours: Tuesday - Friday, 10 AM to 5 PM and Saturday, 10 AM to 4 PM. Artists will be called to pick-up, if your work is not accepted. Not-accepted works must be picked up by May 7th. Information from the artist (entry forms) will be done at time of delivery. THE BIG SHOW: the 300 paintings at New Bern Artworks will be open for ArtWalk on May 14th and remain on exhibit until the end of June. 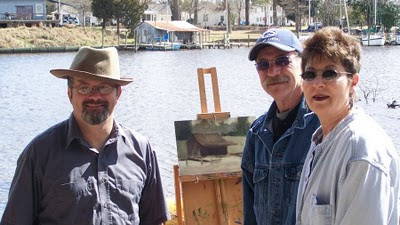 Artists will paint scenes from downtown Kinston, including the river, beginning April 28 through April 30th. Paintings will be juried and then for sale as the art gallery next to Mother Earth Brewery during the Festival on the Neuse. They will be on sale at The Arts Center, 400 N. Queen Street, Kinston for the month following the festival. 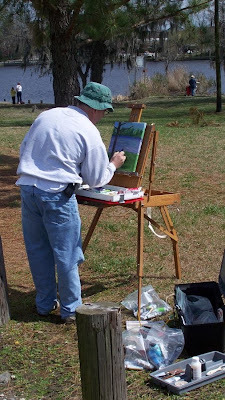 Artists wishing to participate in the Plein Air Paint Out should contact Mary Page Whitley (marypagewhitley@aol.com) or Sandy Landis (slandis@kinstoncca.com). The official Festival on the Neuse poster will be on sale throughout the month of April at The Arts Center. This poster features the first place painting from last year’s Plein Air Paint Out. Winner Juliet Barrus’ painting, Nature Center, will be featured. Posters are $20. LAST CHANCE ~ ArtExposure Workshops for the 27th. Last week to sign up for the "Oil Painting" and "Essentials of the Digital Camera", both on March 27th! Supplies for the Oil Painting Class are available at ArtExposure. 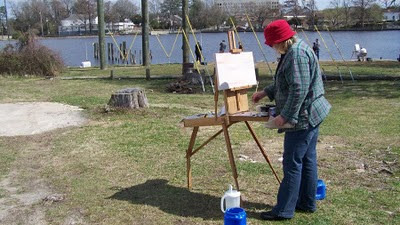 New River Paint Out... GREAT to be Outdoors Painting! 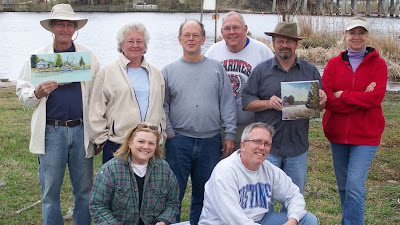 OOPS Members present... LtoR: Mitchell, Penny, Sherry, Stephen, Tom, Dean, Bernie, and Karen. Not pictured but joined us... Donna and Earl, Bonnie from Burgaw, and John from Oriental. Bernie... Bernie and Mitchell opted to paint under the Old Bridge where it wasn't quite as windy. Patsy having a good time. Penny also painted out of the back of her van but I failed to get a photo... sorry Penny! 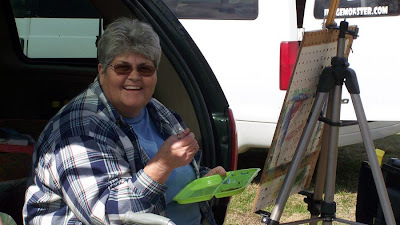 Sherry working at her new French easel. John joined us from Oriental. 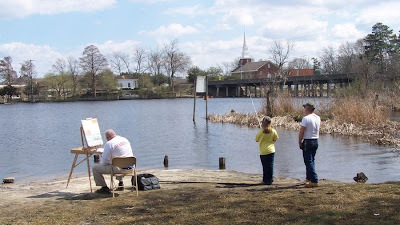 Tom picked out a great spot for painting and fishing! Our newest member... Bonnie from Burgaw. Welcome Bonnie! Stephen found a cool tree to paint. Bernie with his Uncle Ronnie and Nancy who both live across the river. A GREAT day of painting... see you all April 25th for our next paint out! Dean is organizing this paint out at the Belgrade Rock Quarry... a BEAUTIFUL spot full of painting opportunities! We'll have all the details soon. See you all at our paint out this Sunday... It's supposed to be a beautiful day!